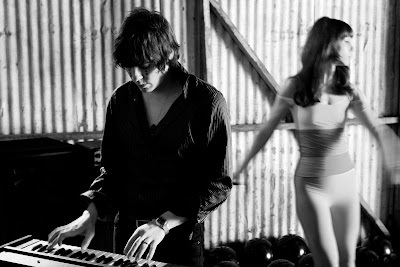 Whether they like it or not, Indie Disco duo Glass Candy have a lot fans. “This is red, red, red, red…” chants the sprightly redhead Ida No, lead singer of “This is red, red, red, red,” chants the sprightly redhead Ida No, lead singer of Portland’s Glass Candy, on “Digital Versicolor.” The track then reels off each of the colors of the chakra spectrum, which blend together to become white light. When No delivered that opening lyric at the band’s recent Coachella performance, 50 three-foot-wide balloons, each a color of the rainbow, bounced above the 6,000-strong crowd. Regardless of the inflatables’ cooperation, Glass Candy’s purposefully underpromoted Coachella performance was a success. Which is all the more notable given the group’s reluctance to participate in the first place. Fiercely protective of their sound and image, No and Jewel turned the festival down three times prior to this year. “We’re such a conceptual group that it’s important to know when things are appropriate,” Jewel says. “We don’t take the cake just because it’s on the table.